ShoppinGate is this supposedly beneficial web service that should provide alternative offers and better deals for the products you are interested in buying online. Needless to say, these offers should show up only when you are browsing online shopping sites. When you visit them, the suspicious program will detect the products you are viewing and will present alternative offers with better prices. Although this service might be attractive, it does not mean that it is trustworthy. Please continue reading to learn the reasons to remove ShoppinGate from your operating system. As mentioned before, the installer of ShoppinGate is not available from its official website. According to our research, chrome.google.com/webstore/detail/shoppingate/hndnmepncckbldkmiajblfkbenellibi (Chrome web store) is a source that is not very popular. After all, the user count only shows nine active users! If you are not one of the nine, it is possible that this program was installed by a third-party software distributor. Our researchers warn that ShoppinGate could be packaged with malware and adware, which is very unfortunate. If malware was installed, you need to remove it as soon as you possibly can. 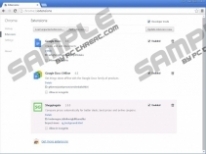 Although ShoppinGate is usually found on Chrome, other browsers could be infected with it as well. Our manual removal instructions show how to delete ShoppinGate from the three most popular web browsers, and, if you find it installed on others, feel free to post a comment below, and we will help you remove it. Hopefully, other unreliable programs are not present on your PC or your browsers, but you should use a trustworthy malware scanner to assess the situation. If malware is detected, install an antimalware tool that will remove ShoppinGate along with other unreliable programs and will ensure that your Windows operating system is protected from malware in the future. Simultaneously tap Alt+F on your keyboard. In the menu on the left click More tools and select Extensions. Find the unwanted add-on, click the trash bin icon next to it, and click Remove. Simultaneously tap Alt+T on your keyboard. Select Add-ons and open the Extensions menu. Find the unwanted add-on and click the Remove button to the right. 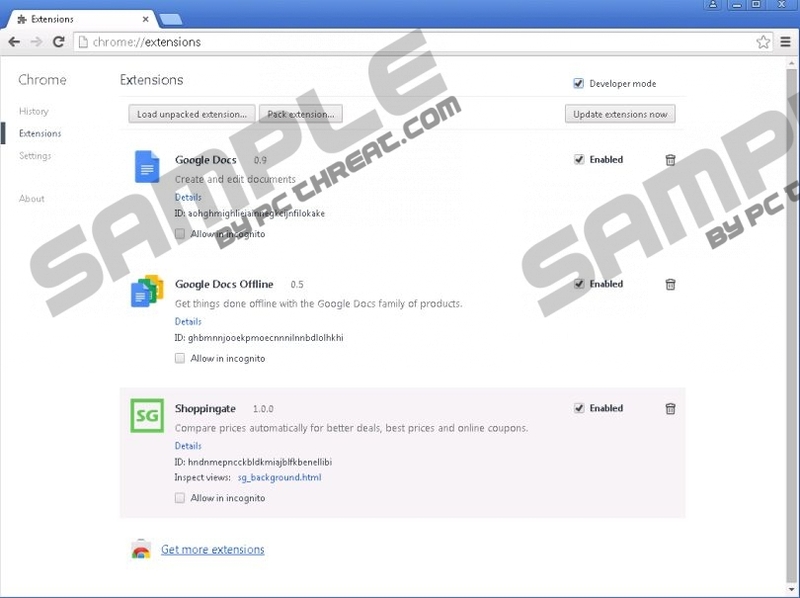 Select Manage Add-ons and navigate to Toolbars and Extensions. Select the unwanted add-on, click Disable, and click Close. Quick & tested solution for ShoppinGate removal.